Mood board: Alessandro Michele’s press notes at Gucci referenced ‘Rhizomatic Thinking’, which took its weird roots from plants that grow sideways, like weeds. In a nutshell, they possess neither centre nor orientation. 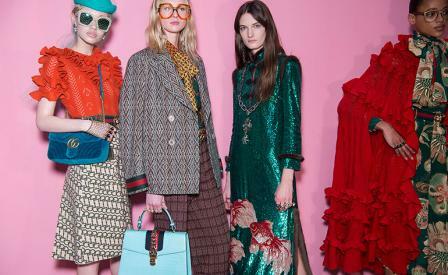 For that matter, neither did the Gucci show that yanked us abruptly back and forth from the languid elegance of the 1930s to the gritty, bespectacled awkwardness of the 1970s while zooming right through the hard shouldered, skin tight, leather linebacker look from the skanky 1980s, all the while scooping on Michele’s signature piles of bankable, highly individualistic accessories. Best in show: There was excellent outerwear in this show including brocade coats with long hairy arms and wild Python patchworks that created rolling landscape scenes on candy coloured coats. Our favourite looks continue to be Michele’s signature long dresses that screamed polite elegance such as one celery green chiffon stunner with sleeves that fluttered like clouds around the wrists. Finishing touches: An exhaustive list of Michele’s accessory line up would read longer than the Christmas list of an entire city’s child population. Safe to say he’s in very familiar territory here. Basketball knee socks worn with sparkling ladylike Mary Janes and 1930s prim hats worn with veils were new additions to Gucci’s growing stable of extras.